My recent post, You Matter: Conversations That Count, was a huge hit! The open and share rate was nearly 19% higher than the three previous articles. Obviously, the topic hit home to many people. The relevancy made me smile. You see, my book, Conversations That Sell’s working title was Get Real, Win Sales. My publisher, AMACOM, renamed it for marketability and to better describe that it is a book to make your sales conversations collaborative. Yet, the message of being genuine, authentic, and ‘real’ is still important to note. Buyers need YOU to show up, not your imitation of someone else. Being yourself gets you further with less effort. The energy it takes to ‘pretend’ is high! Representing a product that you don’t really care about comes through loud and clear in your sales conversations and is both mentally and physically draining. Going through the motions and not caring about the outcome shows in your forced enthusiasm for the end result. And very important to note: Sellers who ‘act’ interested in the needs and problems of their buyers, will never sell as much as the seller who ‘is’ interested. R –Recognize your personal value to the sales process and the total solution your buyer receives. E –Evaluate your actions often. Do your actions match your words? Our actions are often more representative of the real ‘us.’ If you don’t like what you are doing, change it! A –Accept that you won’t be the right person for every buyer. Seek the value of others’ strengths whenever possible. L – Listen to the words others use to describe you. These descriptors represent how you act and sound. If you like the descriptors, keep it up! If you don’t, then change something –your words, attitude, actions, or environment! Getting real allows those around you to trust, respect, and want to work with you. You’ll win more sales, laugh more often, and enjoy your work more fully. Your Turn: When did you discover that Getting Real was key to your success? What is one unique thing about YOU that makes your buyers come back for more? Leave a comment for a chance to win a signed copy of Conversations That Sell. 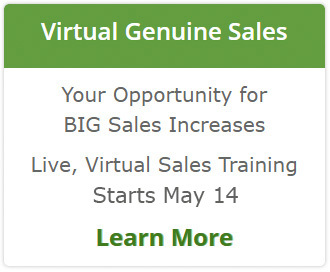 And hiring leaders – check out the FREE webinar: 2 Musts to Hire Top Sales Performers next week. Nancy, I enjoyed this article, as well as your previous one, You Matter: Conversations That Count. Your R-E-A-L acronym particularly resonated with me. I’ve been in sales for a number of years, and have found that if I can establish genuine relationships with my customers, as a real person, not just a “salesperson,” it’s a win-win situation for everyone. When my customers know that I’m on their team, looking to help build their success, and not just looking to make a sale, it gives me more credibility. And I think it’s a blessing that I can call many of my customers friends, not just clients. Thanks again!